Demand for lead-free solder alloys is increasing as a result of legislation designed to protect manufacturing workers, consumers and the environment from the well-documented hazards of lead. Kazuhiro Nogita (shown at right) from the University of Queensland is developing new lead-free soldering alloys for use in a broad range of applications. He recently used powder diffraction (PD) at the Australian Synchrotron to investigate how trace levels of nickel influence the processing and service properties of a popular type of lead-free solder: near-eutectic tin-copper alloys. Kazuhiro first began working with tin-copper-nickel alloys in 2003, when he undertook a small consulting job for Nihon Superior Co. Ltd, an international supplier of solder alloys based in Osaka, Japan. 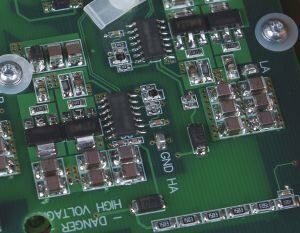 Nihon’s unique tin-copper-nickel alloy has been used in more than 1.5 billion circuit boards since 1999 and the market continues to grow strongly due to consumer demand for electrical goods and the need to introduce lead-free alternatives into products previously exempt from legislation. The PD work at the Australian Synchrotron has helped establish how nickel improves the performance of soldered joints containing the Cu6Sn5 intermetallic phase. It has also revealed the limitations of the nickel stabilisation effect in Cu6Sn5, the thermal expansion of Cu6Sn5 with and without Ni between -100 and 250°C, and the kinetics of the phase transformation of Cu6Sn5. In 2010, a paper by Kazuhiro and his colleagues was judged the best of some 170 papers submitted to the International Conference on Electronics Packaging. The Cu6Sn5 intermetallic forms at the interface between solder alloys and copper substrates. In nickel-free alloys, the hexagonal allotrope of the intermetallic phase transforms to monoclinic as the solder joint cools from 186°C; this is accompanied by volumetric change that will result in internal stresses in a constrained joint. The presence of small amounts of nickel stabilises the hexagonal phase and the transformation to monoclinic does not occur at typical industrial cooling rates. Kazuhiro and his colleagues used powder diffraction under controlled temperature conditions at the Australian Synchrotron to study how these transformations vary with time and temperature. The aim is to identify practical production and operating conditions that will either promote or restrict the hexagonal/monoclinic phase transformation. Promoting a phase transformation during production may be preferable to the transformation and associated volumetric changes occurring during the product’s operating life. Kazuhiro also measured the lattice parameters of the Cu6Sn5 phase as a function of temperature. These measurements will be used to determine the coefficient of thermal expansion and assist in modelling the stresses and strains experienced in soldered components under typical operating conditions. 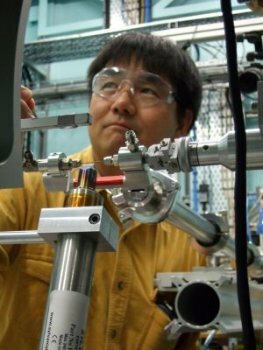 Kazuhiro plans to use the Australian Synchrotron again for his ongoing investigations of the stability of the solder alloys and the intermetallic reaction layers that form between solders and their substrates. He particularly wants to look at how substrates and solder composition influence texture formation, phase stability at low and high temperatures, and stress generation. 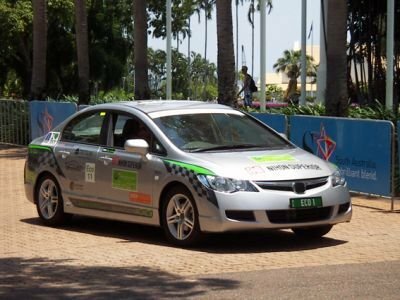 Kazuhiro is an associate professor and principal research fellow in the School of Mechanical and Mining Engineering at the University of Queensland and a Queensland Government Smart Futures Fellow. Above: The battery controller circuit board for electric vehicle ‘Deep Green Research EV’ in the Global Green Challenge from Darwin to Adelaide in October 2009 was soldered with SN100C, a tin-copper-nickel solder alloy that has been the focus of much of Kazuhiro Nogita’s research.